What a brilliant offer! The RRP for all these goodies is £120, but Roo are selling it for £40! 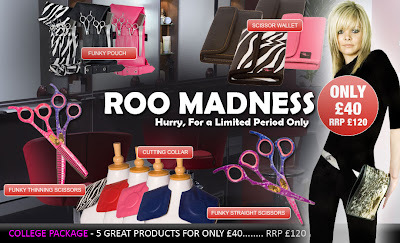 Amazingly good value.You get a whole bunch of goodies, including thinning scissors, cutting scissors, cutting collar (which is reversible for cutting & colouring) scissor pouch (which I'm sure would be great for make up brushes also) and a pouch. With up to 11 different colour options to choose from you can personalise to suit your style. We here at Roo Salon have been helping hairdressing students on the road to a successful career ever since we were first created. And we’ve worked hard to give students, experienced salon stylists, owners and even mobile hairdressers the chance to have high quality products all at an affordable price. 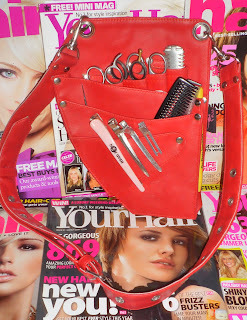 I've already got a pouch in Cherry Bomb, and use it all the time, I wrote about it here. It's great as Roo are helping college goers and trainees to get some nice equipment and build their equipment up. So if you are looking for a present for a trainee stylist, or a hairdresser then I recommend Roo. Or even if it's for you, you can't beat value like that. They offer international delivery, and delivery for this amazing offer is £6 UK, £10 for Europe, and £15 for anywhere else. You can find Roo on twitter, facebook, and the link to the habia college offer is on the left hand side of my blog. Just click and it'll direct you straight there. And it's not just hairdressing equipment, they have beauty equipment, tweezers, nail files and even dog grooming and walking items. 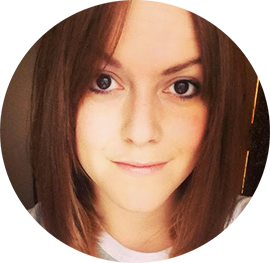 An all round fab website. I can't wait to try out my new thinning scissors and I know the funky cutting collar will be getting some attention from my next client. What would you think if your hairdresser turned up with these goodies? And will you be buying for yourself or a lucky someone for Christmas perhaps?! Looks great! =) Great find!